What happened to Solar Impulse 2’s batteries on those long five days and nights over the Pacific? It took months of enforced downtime in Hawaii to have new batteries made, sent from Korea, installed, tested, and flown again. Could the plane have completed the flight on the original batteries? Kokam, manufacturer of the airplane’s cells, has released new information that provides details of the drive system and relieves a few lingering anxieties. An over-riding concern was that batteries overheated on the Japan to Hawaii part of the mission, topping out at 50 degrees Centigrade (122 degrees Fahrenheit) – above their design temperature. 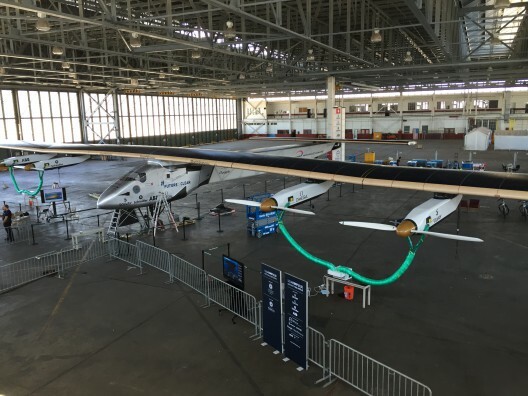 Your editor has thought deeply about what Andre’ Borschberg must have gone through every day of the five over the Pacific, seeing the temperatures on the four battery packs climbing as he pointed the airplane’s nose up in its saw tooth flight profile. Concern, intense monitoring and precise directions enabled the pilot, craft and the four 38.5 kilowatt-hour battery packs to make it through five days and nights of high tension. Kokam’s “Ultra High Energy NMC battery packs” one per motor gondola, have a total of 154 kilowatt-hours of energy storage. The 150 Amp-hour cells made 17 flights totaling 26,744 miles (43,041 kilometers), fed by the 17,248 silicon solar cells on the wings, fuselage and horizontal stabilizer. Those cells produced 11,000 kWh of electricity during the around-the-world voyage. The lithium nickel manganese cobalt cells produce high energy, sometimes associated with a propensity for thermal runaways. If the cobalt would lead to that, the manganese seems to act as a butter to prevent such problems, and NCM chemistry has a good safety record. 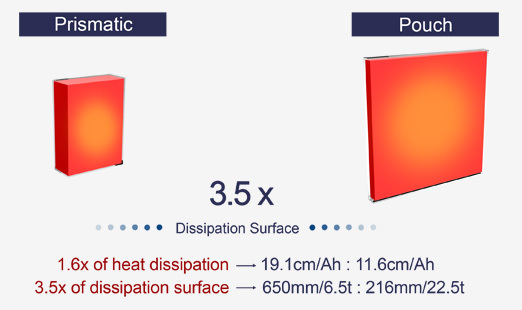 The cells’ 96-percent efficiency keeps helps reduce temperatures during charging, and the pouch-type configuration provides a larger surface area to disperse heat than that available to prismatic or cylindrical cells.. Solar Impulse technicians decided to remove the battery packs when the airplane landed in Hawaii. 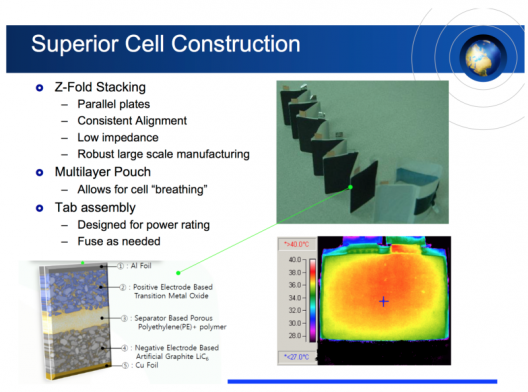 Testing in Germany, where the batteries are packaged for use in SI2, found the cells were undamaged even after exposure to higher than normal temperatures, and had lost only that capacity they would have in more normal circumstances. SI2’s batteries were subjected to extremes of temperature and multiple days of uninterrupted charging and discharging, and still managed to perform at high levels of performance and reliability. This in itself should provide encouragement to others now designing future electric aircraft.